I would love to show pictures, but I don't have any way to post them. You will probably find that almost everyone who treats their jewel cases like precious gems, will tell you that eventually from storing your DVD's this way, they will get scratched. Trust me, the naysayers are full of sh*t.
Not one of my discs has shown any type of wear what so ever. Some films have been removed and replaced dozens of times too! And the true beauty of storing in this manner is safety. If you ever have a fire, you can grab the folders a Hell of a lot quicker and easier than if your DVD's are sitting side by side on shelves. At the moment, there are over 1000 discs in those binders, sorted by decade for main films, with Cartoon collections, Extra's, Documentaries and Television each getting their own binder(s). Click on the DVD, and it plays . That's 1800 DVDs stored in a space smaller than a washing machine. This was several months ago. The little one is full too, now. I use electronic storage. The Sony CX995V is one of the most compact ways to store 400 DVDs, and oh by the way it includes an amazing upscaling player with DVD output - less than $250. I have 3 of them, plus 3 VGPXL1B2 200 disc changers with DVD-RW. All are computer controlled through DVD Profiler. Click on the DVD, and it plays . That's 1800 DVDs stored in a space smaller than a washing machine. I don't think this will work for my Blu ray discs. Ha, that's what I want! Well you know, thinking out of the boix - a CX995V used as simply "storage" is still cheaper than many solutions, even the Dacal Carousels. Dacal = $120/150 discs. CX995V = $250/400 discs. Both can be programmed with LoadDVD to spin to the correct disc and pop it out for you when you click on the icon. I know, sounds silly, but on a purely "dollars and cents" analysis, using that changer could still be a pretty cheap way to safely store and access a whole bunch of discs. And if you have a mix of DVD and Blu-Ray, you could program the script to play the DVD, but pop out the Blu-Ray instead of playing it. Anyway, I know this is kind of a silly discussion. Just wanted to point out some possibilities. As for myself, I plan to get one of the Blu-Ray changers someday, and I still have two projects in process to retrofit a Blu-Ray drive to one of the old DVD changers. Very slow progress on that. Hmmmm let's see I would need 12 of them just to get started. ErK, Sony has two new BD Mega Changers (400 Discs), one is $799.00, the other one is....are you sitting down $1800. No thanks, lovely idea but way tol much hardware expenditure. 12 of them now, would expect to have to purchase 2 more next year, plus the DVDs and BDs. <quivering>I think I'll just go sit in a corner and meditate. I picked up 5 of these DVD cases on Craigslist for 25.00 each from a DVD distributor that went out of business. I only needed 3 1/2 and still have an extra one for additional purchases. I set them up in my basement which in turn will be converted to a library for the LP's, 45's, 78's, cassettes, CD's and DVD's. Yeah, the price of the BD changer makes the whole equation different. But if you only talking storage, not actually playing the disc, you could store (only) a BD disc in the DVD changer for about 50 cents/ disc, which might compete favorably with the price of cabinets and square footage floor space. But then I'm a techno junkie - I don't mind hiding my jackets in shoeboxes in the garage, as long as some lights are flashing in the den! You are lucky. I have to run dehumdifiers in my basement, and I couldn't put my library cabinets directly on the floor. Just a gentle nudge to make sure you've covered yourself for that possibility. 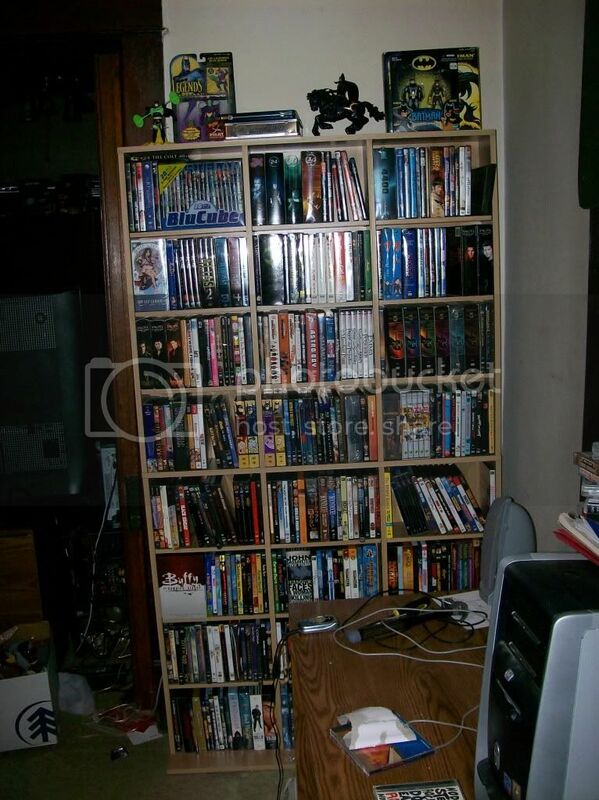 BTW I estimate those cabinets hold about 400 DVDs each ... you got an amazing deal!!!! The cabinets hold 480 each, the basement is completely dry and has heat and air conditioning. No need for dehumidifiers. The other side has a finished laundry room and the back side has a workshop setup with all my tools. The other half of where I am building the library will be a tempertature controlled storage area. There are drains in the floor in the event there were a pipe burst, but I am anticipating that to not happen. And if it does, I am insured. You certainly did get lucky, Bill, i think I am jealous. Is there any technical limit as to haow many of these can be used together? I don't think so, but if you want to control them with a common controller, I think they are wired for 3 sets of remote codes. The expensive changer has a serial port, so theoretically you can control as many as you have COM ports on your PC. The CX777.exe program that everybody uses I think is limited to 3 ports, but that can be changed - source is available. I don't believe there is any kind of daisey chain concept. Now the BD boxes also have an Ethernet port for the enhanced Blu-Ray. I'm not sure whether or not it can be controlled over the IP network. I don't know much about those high-end "ESCIENT" type solutions. They can probably do anything you want for the big bucks they cost. Plugin plug time : Be assured that I will provide whatever LoadDVD enhancements are required to control the BD monsters, although I have heard that they respond to the same controls as the CX777ES. Future plans call fro embedding that code so that the CX777.EXE is no longer required.